To make a jar of pickled anything look beautiful, an added flower head of dill can do the trick. 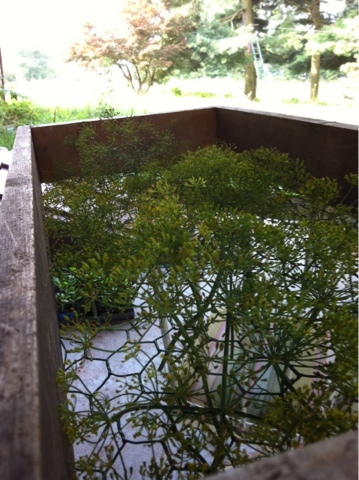 The plant grows and we harvest dill for weeks. 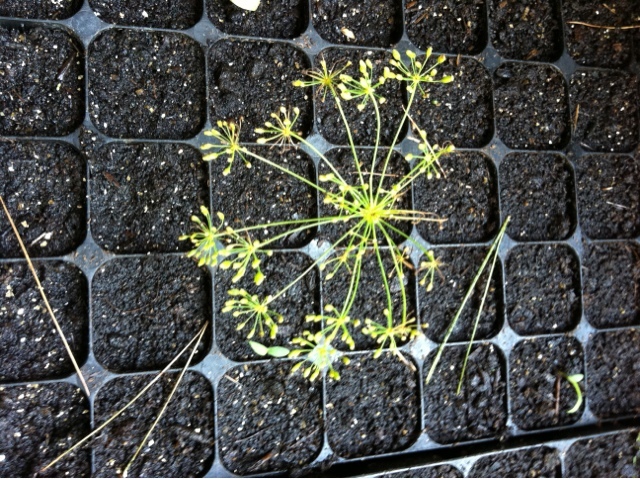 And then the flowers begin to open, and any recipe that calls for dill can have the flower instead. The flower smells just as delicious, tastes just as good and looks cool. The tastes of summer: basil, dill, parsley, sage, cilantro. When we see the prices of fresh herbs in the store ($2.99 for 2.5 ounces of basil, packaged in a hard plastic shell that will take centuries to decompose) it is so wonderful to have plenty of fresh herbs! As I hand out basil in large bunches, and people tell me of processing it and freezing in small batches to use as a foundation for winter time pesto, my heart sings. What a wonderful use! At the same time tomatoes are coming in. And folks are telling me the same thing: cutting out cores, popping the tomatoes into the freezer for wintertime soups and stews. Plenty to eat now and later. Ridiculous good twice!